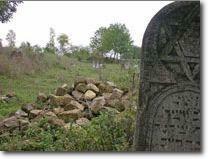 There is a large Jewish cemetery on the outskirts of town, on the north side of the public road leading to Lisivtsi. Surrounded by agricultural land, it is located on an elevated hillside just in front of the modern Catholic cemetery. The grounds are relatively well maintained and are mostly free of undergrowth and other vegetation. Apparently restoration work was carried out in 1980-1990, and the grounds continue to be tended by the municipal authorities or local residents whose goats keep the vegetation under control. This compares favourably with the old Catholic cemetery, which is not maintained at all and has been totally overgrown with shrubbery and trees. 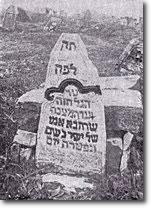 Incidentally, as reported elsewhere in the account of Ba’al Shem Tov, the gravestone of the Besht’s mother (pictured below) was observed in the cemetery until at least April 1944. Today, many of the tombstones are no longer completely upright – many are tilted over at odd angles – but their inscriptions are still plainly visible. 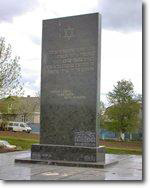 As reported in the Jewish history section and in the account of Baruch Milch, found elsewhere on this website, it is estimated that between 2,000 and 3,000 Jews were murdered at this location on 27 May 1943. They were rounded up in the market square and then led in groups of 100 at a time to the cemetery, where they were shot and buried in mass graves. 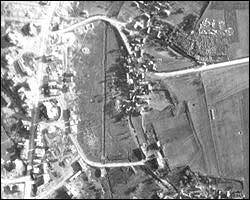 Aerial photographs taken by German reconnaissance aircraft in June 1944 confirm this atrocity. The Jewish cemetery is situated in the upper right hand corner of this photograph. 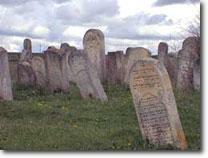 In the enlargement (viewed by clicking on the image), one observes row upon row of densely packed tombstones. Amidst the main grave area containing 25 or so rows of tombstones, there is a large circular clearing towards the road where one can make out the outline of two rectangular shapes. Further in from the road, to the northeast, there is another circular clearing surrounding what appears to be single, large rectangular shape. It is believed that these shapes represent the mass graves of the victims of the May 1943 massacre. The aerial photography also confirms the point made by Isaakovitch, above, regarding the removal of tombstones. A majority of the formerly densely packed tombstones are no longer there today; indeed, one can see the broken remnants of some of them in the margins of the cemetery. Clearly, as Isaakovitch reports in his 1996 survey, the cemetery was vandalised during the war and apparently in its aftermath, though not in recent times. It is speculated that many of the tombstones were removed after the end of war for use in road and building construction. I returned to the Jewish cemetery in October 2006 to investigate the feasibility of photographing the tombstones and having the inscriptions transcribed and translated from Hebrew into English. I estimated then that there were about 400 (+/- 100) tombstones left in the cemetery, of which at least half have fully or partially legible inscriptions. I took 'test' photographs of about 40 individual tombstones, whose inscriptions ranged from 'very clear' to 'difficult to read'; and Sara Mages kindly volunteered to transcribe these samples. UPDATE (2018): I’m pleased to report that in 2014, the Jewish Galicia & Bukovina Organisation undertook a major effort to photograph, document and map the entire Jewish cemetery of Tluste. Click: Jewish Cemetery - Tombstones for more details of my initial efforts to document the cemetery, and links to the subsequent follow-up work done by the Jewish Galicia & Bukovina Organisation. International Jewish Cemetery Project: https://www.iajgsjewishcemeteryproject.org/ukraine/tolstoye.html; last accessed on 3 December 2017. German Flown Aerial Photography, NWDNC-373-GXPRINTS, 1939-1945. National Archives at College Park, Maryland.